…….A location project around star dancer Nijinsky. 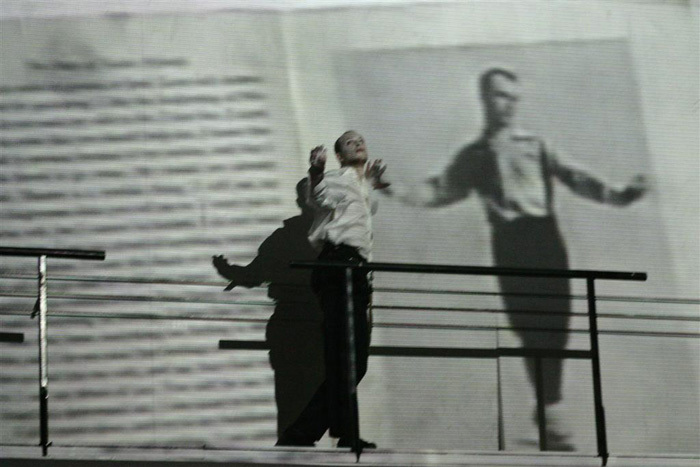 The scenography was born from the idea that we only know Nijinsky from 2D material: photographs. Nijinsky lived in a time that was not only revolutionary for music, but also for dance and painting. That is why Kortekaas chose to create a flat almost 2 dimensional image, a painting. Within the latter 8 dancers evoke the life of Nijinsky, while they interact with video images made by visual artist Piet Dieleman. Dielman uses a pencil to slowly draw (live) a death mask taking Nijinsky’s diary notes as a starting point: Nijinsky’s schizophrenia. Georges De Decker composed a ‘surround’ mother tape in four movements: youth, education, the years of success and the mental ‘downdrain’ of Nijinsky. Additional to this mother tape there were live musicians: percussion, piano, trumpet and vocals. Working with different talents within one frame, namely that of a painting, makes ‘Nijinsky a painting’ a real Gesammtkunstwerk…..
choreography: sarah wicktorowitz in cooperation with the ronnie haver dancers, bruno catalano, eva puschendorf, philipp fricke, peter cseri, yvonne weschke and ronald wintjes, video dancer/ choreographer: jean-guillaume weis. (Grand Theatre Groningen& Diaghilev festival Groningen).